My two-and-a-half year old daughter is really into Disney movies now. She has gone through phases of loving everything from Snow White to Ratatouille. Their catalog is extensive enough that we don't have to repeat very often, though she often gets stuck in a rut, requesting the same film over and over again. The Lion King and Beauty and the Beast are her two favorites. Last night, though, we watched Peter Pan, and, as I sometimes am, I was struck by a theological chord in the first scenes. When Peter tells the Darling children that they can go with him to Neverland, they ask how to get there. He tells them that they'll fly. When they try and fail, Peter is puzzled. "This won't do," Peter mumurs. "What's the matter with you? All it takes is faith and trust." I could almost hear the frustrated preacher behind those words. "What's the matter with you, congregation of mine? Why aren't you doing Good Christian Thing A or Good Christian Thing B? All it takes is faith and trust!" Most pastors, and for that matter, Christians in general, have too high a view of human ability (anthropology). We are left wondering what is the matter with us when we try to do something and fail. We wonder why our minds drift to the same selfish or impure places day after day, despite our efforts to control them. We wonder why our children exasperate us so...they're just kids. We wonder why our relationships seem to falter when we've tried so hard to make them work. But Peter Pan is forgetting something: "All it takes is faith and trust. Oh! And something I forgot...dust! A little bit of pixie dust." And so, the magic ingredient introduced into the situation, flight is possible. Sure it helps to set your mind on "the happiest things," but the pixie dust is the key. It's the fuel that makes the flight go. In the same way, it is the Holy Spirit that makes our "Christian" lives possible. But unlike Tinkerbell's dust, we can't grab the Holy Spirit and shake a little out. No, it's better than that. The Holy Spirit is promised to us. But it's the pixie dust that allows for flight, not the quality of the faith and trust of the Darling children, and the Holy Spirit that allows for Christian life in the Christian. Someone said that as one's anthropology increases (as one's opinion of human ability goes up) one's Christology decreases (one's reliance on Jesus goes down). Let's always remember that, without that pixie dust, no one's getting to Neverland. Great post! 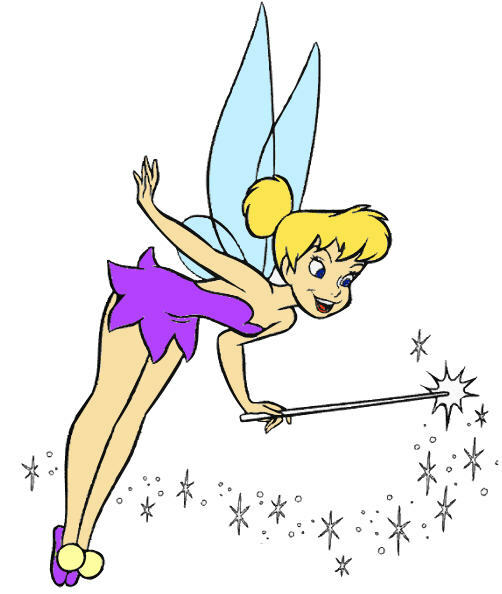 One key difference between the Holy Spirit and Tinkerbell is that one is far less of a tramp. Tink, like all of us, is in some major need of grace. Ho.